This started as a page to log my training for the Marine Corps Marathon 2013. Now that I’ve completed that marathon I’m transitioning that page to a post. Prior to the Marine Corps Marathon I completed 3 half marathons as an initial preparation for this training. This log captures the results of all my training runs as I increased the length of my long runs to prepare for a full Marathon. I had a little over 4 months, but I started half-way ready! I went through several different iterations of a training plan because I was in an over trained state at the beginning of my training, but some training gaps at the beginning resolved this so I settled on a more traditional training plan. I was concerned about my failure to lose weight as part of my half marathon training so I decided to start including my weight. I hadn’t lost a pound running 20 miles a week training for the half marathons. I wanted to lose 20 pounds before getting to the real long training runs. I had hoped that putting my “morning” weight here with my run performance would motivate me to focus on dropping the weight I need to lose to meet my goal, 195 pounds, for the Marine Corps Marathon. However, I failed to lose and keep off any weight during this training either. 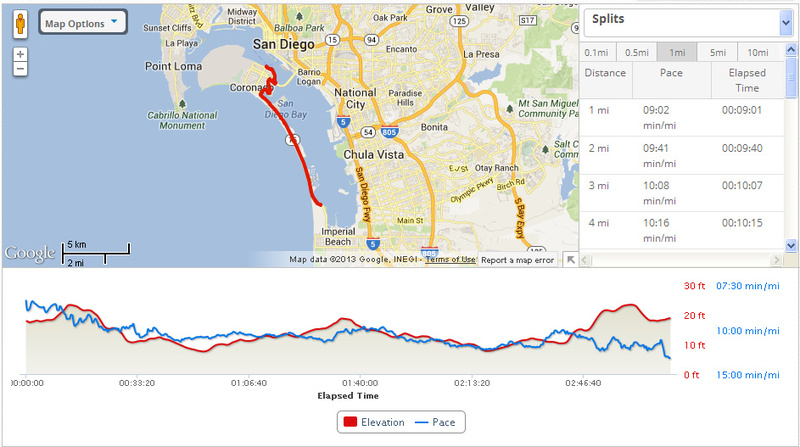 Here is a log of my training runs for the Marine Corps Marathon 2013. 4 Aug 2013 15.02 Week FOUR – 12 weeks to goFlat coastal run. Felt loose for the first 13 miles, then I started to tighten up a little. Need to work on staying loose. 2:34:49 10:19 213 before, and 208 after… but it’s the before that matters. Starting a 10 day vacation. I will run less and shorter long runs. Hopefully I will be less sore and able to train hard for the last 7 weeks. 20 Oct 2013 Week fifteen – 1 week to goI decided not to run again until the Marathon. I’m walking with a limp, and it hurts to run. I’m hoping rest and regular ibuprofen will work. The short runs I’ve tried over the last 2 weeks were doing more harm than good. Besides the pain in my right hip I’m in great running shape. So I hope the rest works and the hip heals! Next entry in this log will be for 26.2 miles! 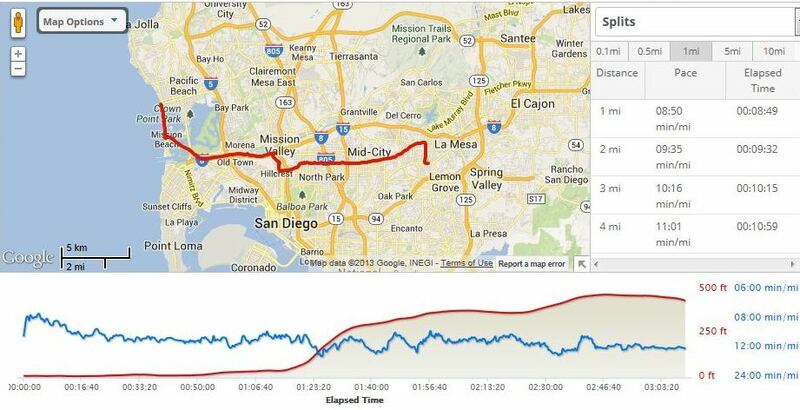 One thing this log doesn’t show is that the marathon was more than just miles of running. I ran in some beautiful places and had a great time on many of my runs, even when I wasn’t feeling my best. Here are just a few pictures from my training runs. The process of preparing for the race was as rewarding as the race itself. Overall this was an unbelievable, irreplaceable experience that was worth every minute of time it took! This picture does not do the August 2013 Blue Moon justice. 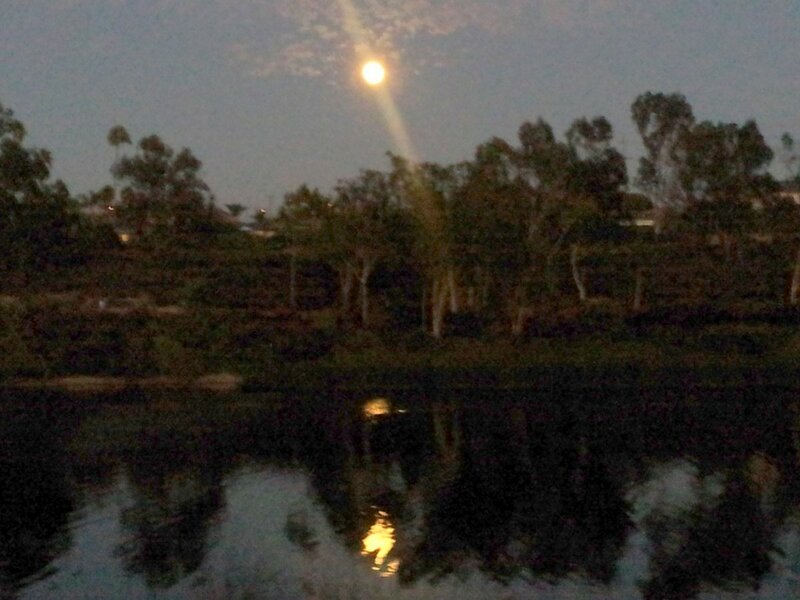 I did a full moon run around Lake Murray on 20 August 2013, the moon was spectacular. Really glad there were no wolves howling though. I guess I’ll only do a run like that every once in a “blue moon”… ugh! 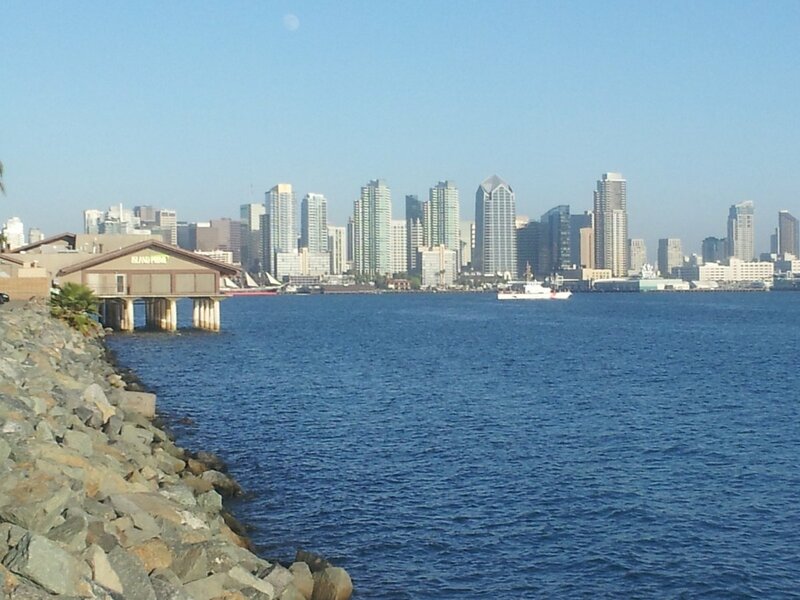 Running along the San Diego harbor was one of my favorite medium length running routes. I will be running here more in the future, and it is one my way home so it is convenient! 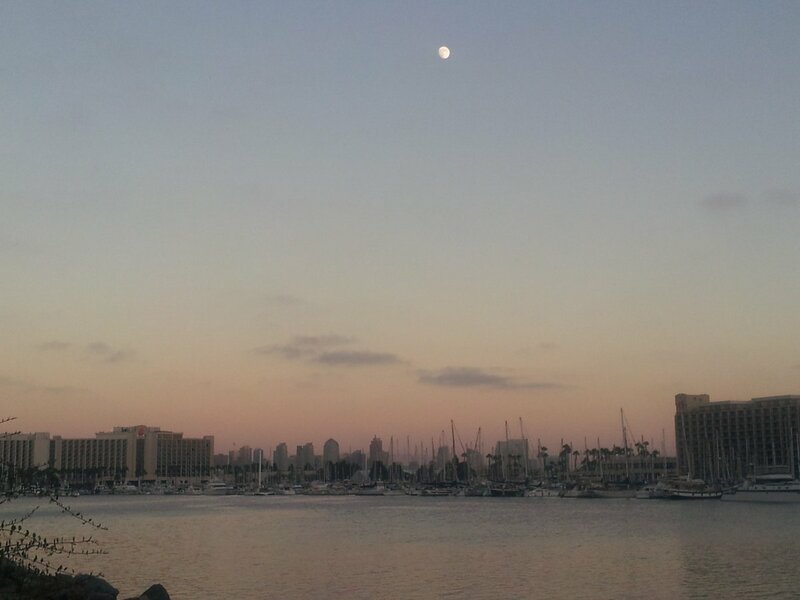 Here is a nice view of the moon rising over the city taken during a run on Harbor Island. A little further into this run as I got to the Northeast corner of the harbor. 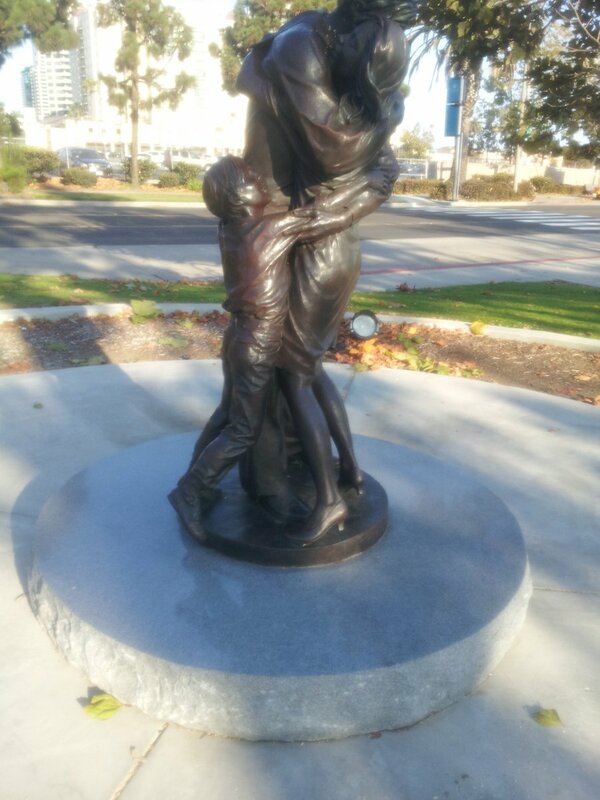 I decided to turn around at the bronze statue of a returning sailor near the Midway Museum. 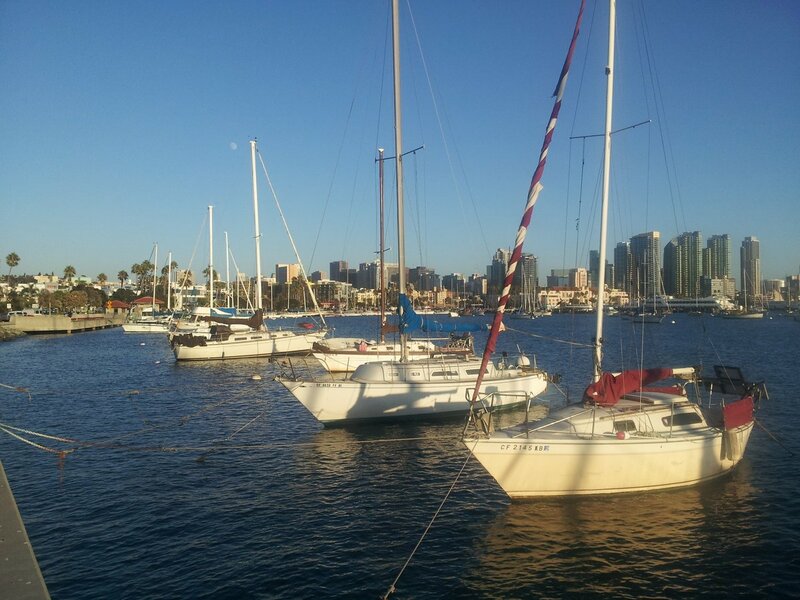 On another run at the harbor that started later in the day.